ABC Friends » NEXT CHAIR MUST CHAMPION PUBLIC BROADCASTING! The next Chair appointed to the ABC must be a passionate and committed supporter of public broadcasting. This appointment must be a person whose appointment will assist in rebuilding public confidence in the corporation’s independent leadership. This is the strong recommendation of ABC Friends National to Prime Minister Scott Morrison and the Communications Minister Senator Mitch Fifield. 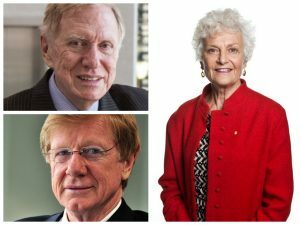 ABCFriends has conducted its own poll and has listed Professor Fiona Stanley AC (a former board member), The Hon Michael Kirby (former High Court judge) and Kerry O’Brien (the highly credentialed former ABC host of Four Corners) as the most credible possible appointees. Some names rumoured as potential candidates the Federal Government’s may favour would clearly fail the basic test of having a record of backing the ABC against political interference. One prominent name has a record for continually and recently attacking the ABC and undermining its public service role. Margaret Reynolds, President of Friends National, has already submitted to the Senate Inquiry its concerns about the ABC Board’s selection process with “captains’ choices’ being favoured ahead of relevant skills and experience in media. The community has recently witnessed the lack of support given publicly to the ABC staff and its independence by the former chairman. Clearly, both Prime Minister and Minister need to be reminded of the appointments process as detailed in the 1983 ABC Act. Furthermore ABC Friends National recommends that the names of potential candidates for future ABC board positions be brought before a special all-party selection committee to ensure diversity of experiences, skills and geographic backgrounds so that a non-political and relevant board is put in place. Finally, Friends joins with ABC Management, with the ABC Alumni Association and others in wanting to ensure financial certainly for the ABC to allow for long-term and efficient planning. Five-year budgets are proposed to succeed the current triennial ones on a rolling basis with the first three years given legislative underpinning. Then, and only then, can the Australian community (Being its ‘shareholders’) hold the ABC Board and Management accountable for satisfying fully its responsibilities as outlined in the Charter, which guarantees the ABC’s independence.